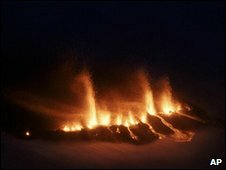 Icelandic fissure eruption triggers worries | Wott's Up With That? “Icelandic fissure eruption triggers worries“. Volcanoes are unpredictable and violent. So why worry about something as slow and dull as global warming? Volcano erupts near Eyjafjallajoekull in Iceland.